The Lothians is the name given to the countryside around Edinburgh. If you intend to tour East Lothian, then you get your first hint of it if you make it to the top of the city's Calton Hill (and you should!). Turn your back to the castle and the city panorama and look in the other direction. Off in the summer haze down the widening Firth of Forth then you might notice the glint of sandy beaches. The Bass Rock (pictured here) is another landmark you might be able to make out from your city vantage-point. The picture here shows it from North Berwick, just one of the little resorts along the coast that are very pleasant places to visit as well. Altogether, an East Lothian (mostly coastal) tour makes an excellent day-trip it from your city base. The flexibility of a car is best - though the bus services are good as well and you can take your own picture of the Bass Rock within a few minutes walk of North Berwick railway station - which has a direct link to Edinburgh. North Berwick - it has a beach, golf course, hill (law) and nice wee shops and cafes plus a direct rail link to Edinburgh. East Lothian's Dirleton Castle and Tantallon Castle are just two of the castles of Scotland worth a look on the excursion described here. The Museum of Flight is another interesting visitor attraction tucked away in East Lothian. Beaches of East Lothian - near the city but not crowded. Start your journey eastwards by heading for Musselburgh, taking the road by the slow road along the coast, past Musselburgh Race Course and Golf Links, (where Mary Queen of Scots is said to have played). By Aberlady, houses are starting to look prosperous, by Gullane it’s looking very well off indeed. Muirfield, sometime venue of the British Open, is between road and sea. Dirleton, with its guardian castle, is signed left, just a little further, in the village of the same name. Driving time is under an hour for these easy Scotland tours. Amongst Scottish castles, picturesquely ruined Dirleton Castle is quite a survivor, revealing a glimpse of medieval Scotland. This 13th-century fortress was originally built by the de Vaux family, originally a Norman family. Stroll around and below the castle you’ll see what is claimed to be the world’s longest herbaceous border. Hmm. This type of planting in Scotland is usually at its very best in August. This Scotland tour from Edinburgh continues to North Berwick. This is a very pleasant little Scottish town, with some good shops and a cheery, breezy sea-side setting. You have the option here of visiting Scotland’s Seabird Centre or even taking a boat trip to the Bass Rock, by this point very conspicuous offshore, to see its spectacular gannet colony. North Berwick town from the top of the Berwick Law, looking over the Firth of Forth to the distant Fife coast. Both the Bass Rock offshore and the Berwick Law onshore are volcanic plugs, ie the solidified lavas in the core of ancient volcanoes whose surrounding rocks have been eroded away. Onward to Tantallon! (It's pictured here on the same warm July day that I took the other pic from the top of the Berwick Law. The barley fields are ripe and toasty out in this part of the Lothians sometimes called 'the Garden of Scotland'. Just keep on the coast road, enjoying views across the Firth of Forth to Fife. You’ll see this castle up ahead. Can't miss it. Its great red-stone curtain wall dourly guards a headland, with the sea on three sides. It is worth spending a little time here - this is the point on the East Lothian tour where history seems very much alive. Mary Queen of Scots once stayed here in 1566. This is another spectacular survivor from medieval Scotland – a massive 14th-century fortress requiring just one main wall for protection because of the sea-cliffs. It is associated with the Douglas Earls of Angus. Stand on the parapet and imagine the three sieges it withstood – though the last one, by the forces of Oliver Cromwell in 1651, damaged it to the point of abandonment. 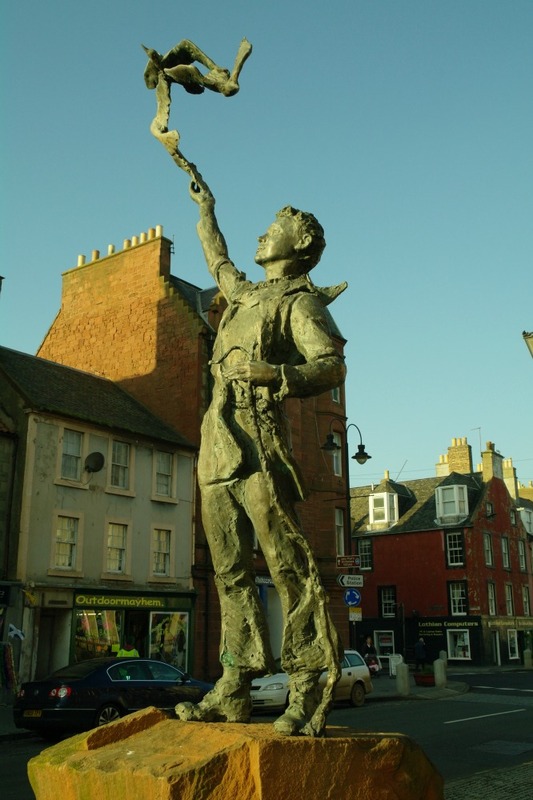 Statue of the young John Muir, in Dunbar on the East Lothian tour. Or you could check out the decidedly paint-peeling and faded but pleasant enough old seaside town of Dunbar. It has a few nice picture galleries and the harbour is worth a stroll. The John Muir connection can also be explored here, as Muir was born in Dunbar, before his terrifyingly religious and domineering father whisked the family off across the Atlantic. By the way, Dunbar is connected by rail to Edinburgh - as many East Coast Main Line services stop there - so it's an alternative to North Berwick is you fancy a train ride. Alternatively, circle into the East Lothian hinterland, with its prosperous-looking barley and wheat fields and lush hedgerows. You’ll soon pick up signs for the Museum of Flight at East Fortune. If you’re any kind of a history buff – and, come on, you’ve read this far – then there is a great atmosphere at East Fortune, as it was an aerodrome in both world wars. Parachute Store, Museum of Flight, East Fortune, East Lothian. But it’s the ambience of the ‘drome that makes it so interesting. Quite a lot of the original buildings survive. You can easily imagine bumping into some leather-jacketed, moustachioed fighter pilot, just at the corner of the huts, and, as such, it’s quite a poignant place. And it’s also where the R34 airship left in 1919 for the very first Atlantic crossing, an 108 hour journey to a landing at Mineola, Long Island, United States. Pictured here is the interior of a WWII parachute store. Hey, I could have shown you a picture of a historic 'plane but you know what one of those looks like. For all I know it could have been in this very parachute store that one of the staff, talking to a pilot, first used the famous line '...and if it doesn't work bring it back and I'll give you another one'. Lots more to see in East Lothian, but it’s been quite a long day on this tour from Edinburgh. Return to the capital by the main A1. Follow signs for Haddington to find it. En route, real Scots enthusiasts may want to look at nearby Athelstaneford where its National Flag Heritage Centre portrays the place's associations with the origins of Scotland's flag, the Saltire. The handsome east coast Lowland town of St Andrews is on the list of Scottish must sees. Ancient ecclesiastical capital, venerable university and, yes, golf. Plus yummy vanilla slices. (We tell you where!) Atmospheric, comfortable, lots of points of interest and easy to reach from, say, Edinburgh, it's a good choice for the 'generalist' tourer.